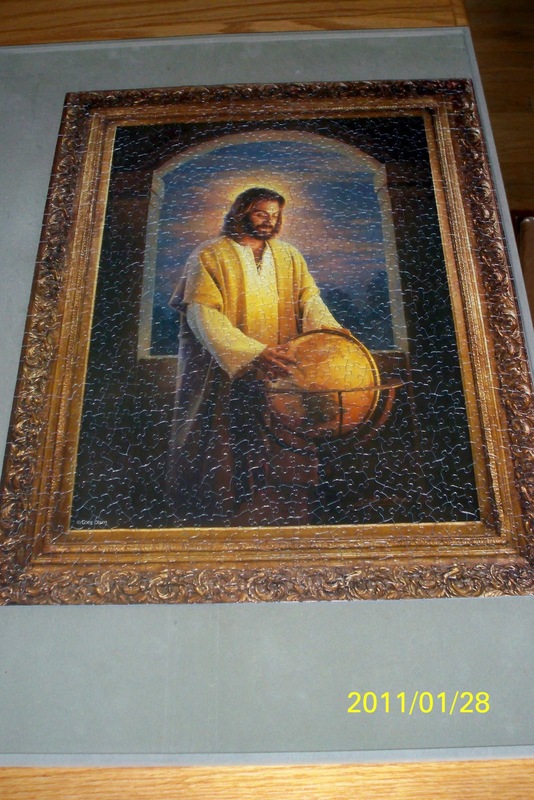 Well, Grandpa finished the "Peace on Earth" puzzle today. Except he left the last 2 pieces for me to put in. You wouldn't believe but he already has the puppy dog puzzle out and is working on the border. It's kind of funny because the puzzles are layered on top of each other on a foundation. When my friend Fran came yesterday he showed her the wedding picture puzzle because it is still altogether. We just don't have the heart to take them apart just yet. Tim and Kathy are MINUTES away from taking off to Costa Rica. Have fun my children! We master our MINUTES, or become slaves to them; we use them, or they use us. "So be careful how you act; these are difficult days. Don't be fools; be wise: make the most of every opportunity you have for doing good." 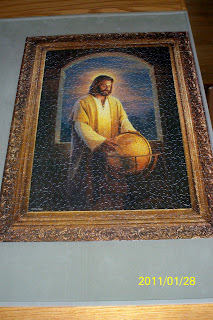 thank you for sharing and posting..
Oh wow, he must have been very patient to finish this puzzle. Thanks for your words.